Hi everyone! Today’s post features the lovely Lohi from Lohiscreations . I am delighted that she agreed to make one of my favorite dishes i.e. 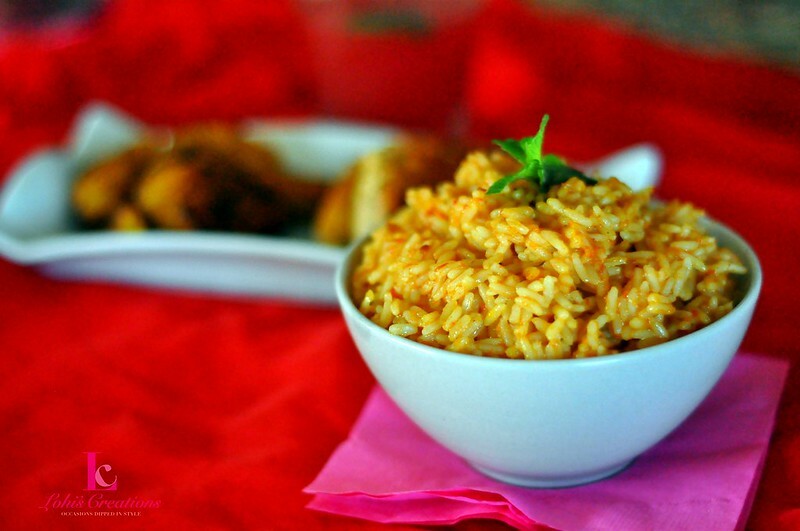 Jollof Rice. Her blog has a lot of exotic cuisines and seriously, I am always hungry each time I visit. Being pregnant, I am always hungry with a desire to eat anything that looks yummy. 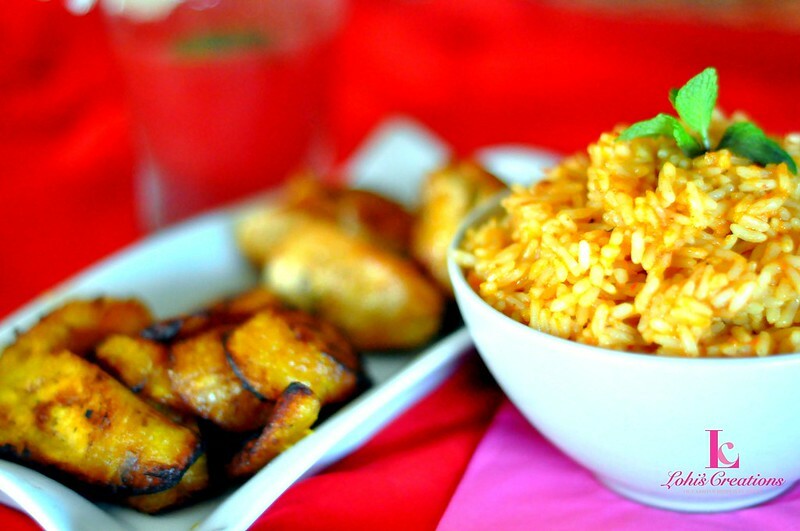 Below are quick steps for making Jollof Rice. If you have never tried this dish, I strongly recommend you try it out. I love the addition of garlic, ginger and basal...nothing beats the aromatic smell of spices. Enjoy! 1 1/2 large onions/ half diced. In a blender, puree your tomatoes, onions, red pepper, scotch bonnet, ginger and garlic. In a clean pot,on medium heat, add oil and allow to get hot. Add diced onions and allow to melt. Add blended puree and can of tomato paste and allow to fry for 4-5 minutes, Stirring consistently so it does not get burnt. Add knorr/maggi cubes, curry, and chicken broth and stir. . . Allow to boil for 25 minutes on medium heat. Add more broth/water if needed and taste for salt. Add salt to your taste. When the rice is soft to the taste and almost dry, add chopped basil and stir. The rice is ready when it is dry with no puree and cooked. 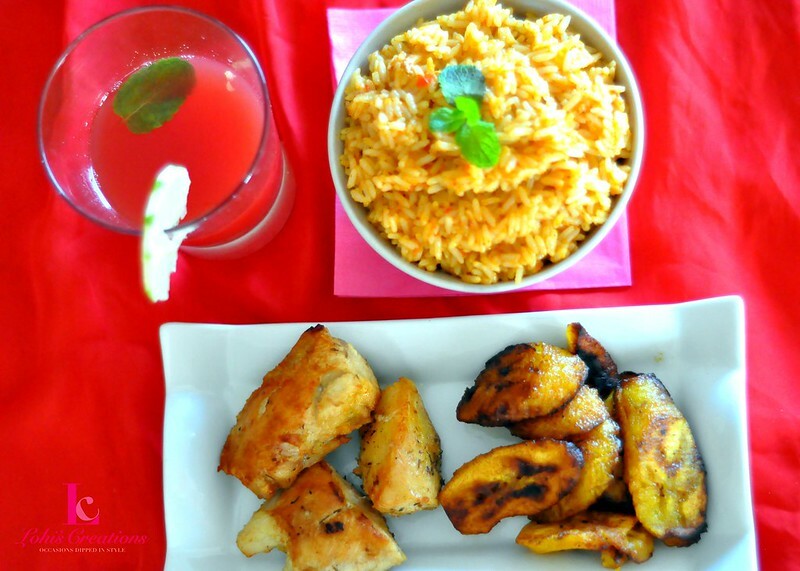 Serve with grilled/fried chicken and fried plantain. I love Jolof Rice! The Liberain version is a bit different but this pic is making me hungry! Thanks for making my hungry Stella! The picture make me crave it so much and Im not even pregnant. Never tried it with ginger or garlic before. May try that sometime. Yeah, I love Lohi Creations; I do follow her bog too. Check out my new post. Just went through your previous outfits post, 'Big Congrats' on your pregnancy:)super happy for you, yummy jollof rice. Uhmmmm I want some Jollof Rice and Plantains.